Twinkle! Twinkle! Twin Star Quilt Block: 6", 7-1/2", 9" and 12"
The interwoven points of the Twin Star quilt block are much easier to make than they look. 3-patch quarter square triangles make it happen. 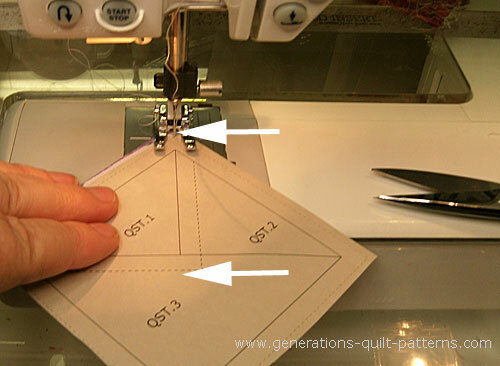 Paper piecing is the key to perfect points and seam allowances. All you need to be able to do is stitch on a line. Easy Peasy! 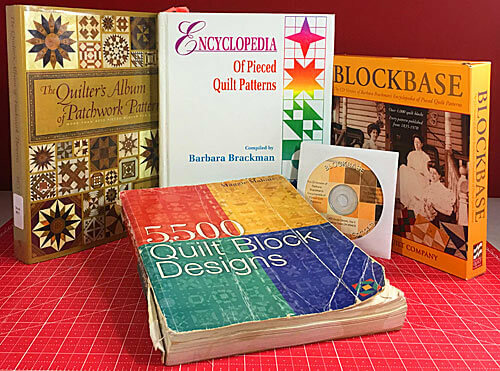 Do you hate paper piecing? Not to worry. If you prefer traditional piecing, there's a cutting chart and instructions for that at the bottom of this page. I like to use an open toe applique foot for paper piecing because there's nothing between my eyes and the stitching line. I also prefer to prewash and then starch my quilt fabric. Starched fabric allows you to get a good fingerpress which helps you minimize trips back and forth to the iron. 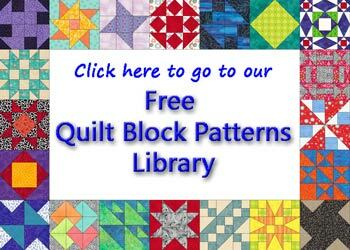 To download the free patterns, YOU must have Adobe installed on your computer. You can get it here if you don't already have it. It's simple. My patterns have dashed placement guides to make the positioning of the first patch virtually foolproof. With Adobe, they show exactly as intended—a dashed line. In other programs they render as solid lines. That can make it confusing, especially for the beginning quilter. 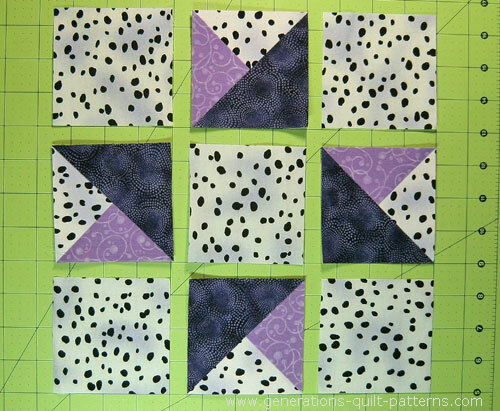 Choose your finished block size from the table below and print the corresponding pattern. 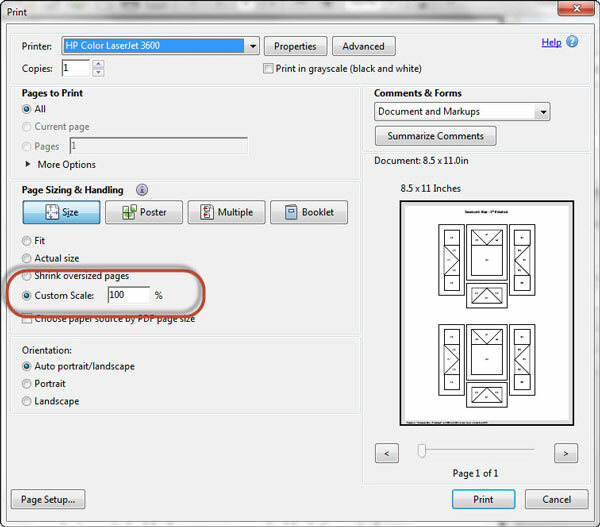 To print blocks at the correct size, under 'Page Sizing and Handling' in Adobe's print menu, set 'Custom Scale' to 100%. 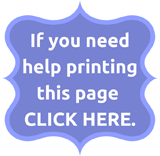 Click here to see where it's at on the Print Menu page. NOTE: If you'd prefer traditional piecing, click here to go to that information further down on this page. All the patches in the cutting chart below are squares, i.e. 3-3/4" means cut a 3-3/4" x 3-3/4" square. You can use this same pattern and with different placement of the light and medium fabrics create a star that 'spins' in the opposite direction. In this version, the #1 patch is a light background fabric. 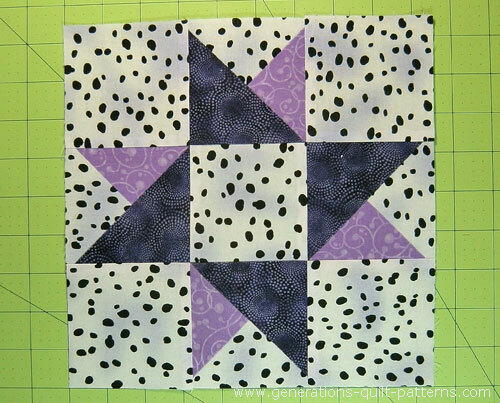 This fabric placement is what we'll use for our sample block in the following tutorial. Don't forget to subcut Patches #QST.1-3. NOTE: Since this is an asymmetrical design, the paper piecing pattern may look backwards to you. Don't worry. The printed side of the pattern is actually the backside of the block and it should look backwards. Install an open toe applique foot if you have one. Reduce your stitch length to 15-18 stitches/inch. The reason is two-fold: 1) More stitches mean there's more perforations making it easier to remove the pattern; and 2) The extra stitches spread out the stress on the seam when the paper is removed. 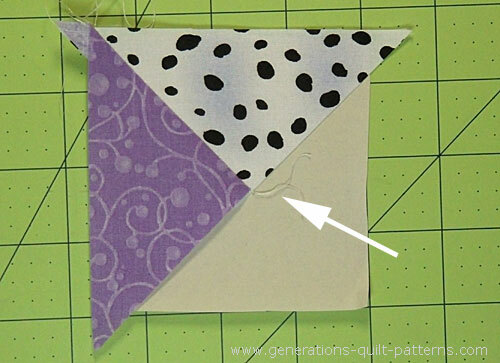 Cut out four QSTs—cut just beyond the outside dashed line. With a tiny bit of Elmer's Washable glue stick (goes on purple/dries clear) position QST.1, wrong side of the fabric to the unprinted side of the pattern. Use the dashed placement guides to make positioning this patch foolproof. 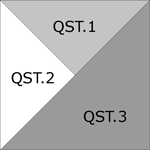 With RST, position QST.2 exactly on top of it. Match the edges of the QSTs. Stitch, starting before the solid line begins and after it ends, on the line between the first two patches. Start and stop stitching at the arrows. Trim away this little thread tail, it'll be covered by the next patch. 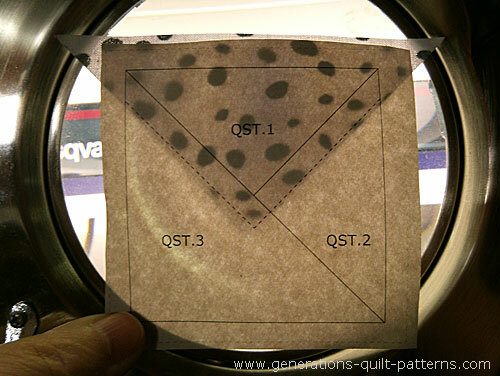 With RST, align the long edge of QST.3 with the sewn patches. Don't bother trimming this thread tail just yet. We'll get it in the final trim. Stitch on the line, starting and stopping past the outside dashed lines. Trim the block to size by positioning the quarter inch line on your ruler with the solid black outline of the block. Trim. Repeat for the other three sides. 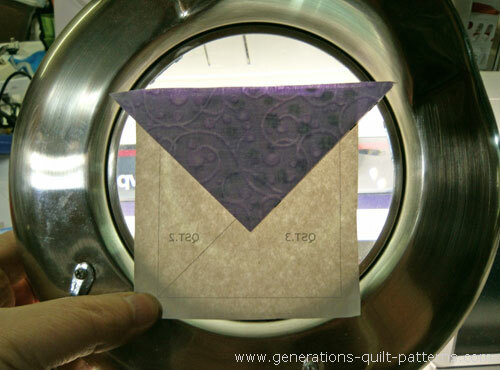 This also trims away all the thread tails at the outside edge of our Twin Star quilt block. Install your standard quarter inch foot—the seam allowances are 1/4" for the rest of the block. 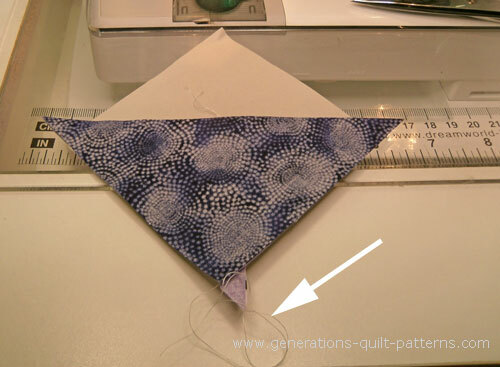 Return your stitch length your normal piecing length. Arrange the units into the Twin Star design. The light, background patch is on the outside edge of our Twin Star block. 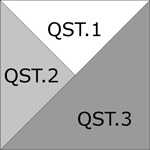 The QSTs are rotated a quarter turn as you move clockwise around the block. Stitch the rows together. Seams are pressed toward the solid squares. And finally, stitch the rows together. Use pins to match the seams if needed. 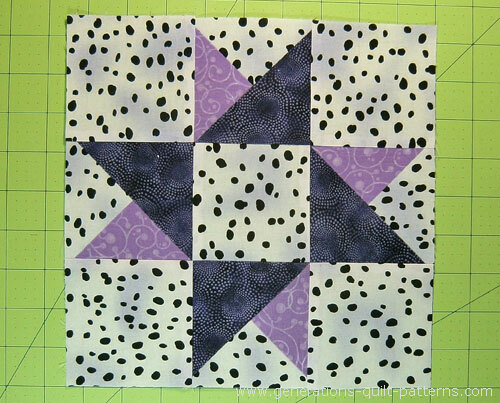 Click here to see what your Twin Star quilt block looks like if you swapped the light and medium patches. 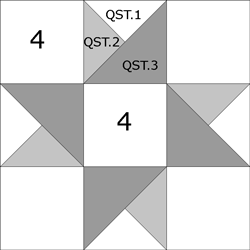 As promised, this is the cutting chart for a Twin Star quilt block with traditionally pieced QSTs. The measurements in the table are exact. Personally, I prefer to use oversized patches and then after stitching, trim them to a perfect square. I add a 1/4" to each of the QST.1 thru QST.3 patches and then cut them. The numbers represent squares, i.e. 4-1/4" represents a 4-1/4" x 4-1/4" square. 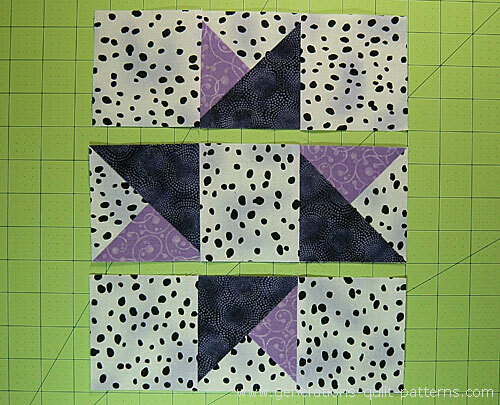 After cutting, click here to go to Step 2: Assemble the units on the Double Pinwheel quilt block tutorial. 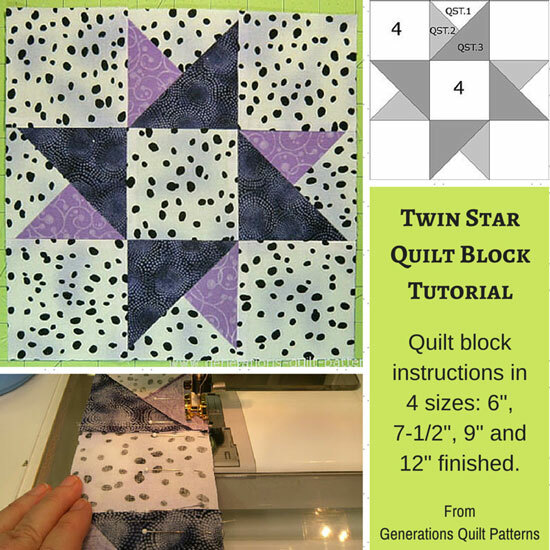 After completing your QSTs, return to this page with the 'Back' button on your browser bar and continue on with Step 4: Assemble your Twin Star quilt block on this page.